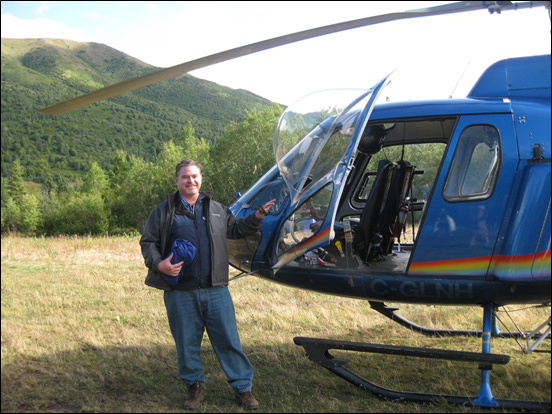 Here I am, hopping into a helicopter to take off and look at some hot uranium prospects, in Newfoundland, Canada. Boy, I can’t wait to find the next motherlode. But wait! That isn’t me now. That’s me a decade ago. During the last uranium bull market. And you know what? The company I was visiting never developed that uranium asset. It ran into trouble with the locals, as many of these exploratory projects do. It turns out many people just don’t want to live near a uranium mine. You’re going to find that hard to believe. (That’s sarcasm.) Never mind that the land is significantly LESS radioactive after mining, for the simple fact that all that uranium is removed. The uranium price peaked in the last cycle at $136 per pound. That was in June 2007. Prices slumped, and then started to recover again in 2010. By 2011, everyone was convinced uranium prices were going even higher than last time. Then the Fukushima Daiichi nuclear disaster happened in March 2011. An earthquake and subsequent tsunami triggered three freakin’ nuclear meltdowns in one spot. And the uranium market got destroyed. Great stocks of great companies — run by hardworking people — were stuffed in a barrel with rabid weasels and rolled down a cliff. Metaphorically speaking. The point is, you can do everything right, and still Fate can come along and kick you right in the groin. There were at least 500 uranium companies at the peak of the last uranium bull market. Now, there are maybe 60 tradeable companies. For an industry that delivers about 11% of the world’s electricity. And 20% of America’s electricity! 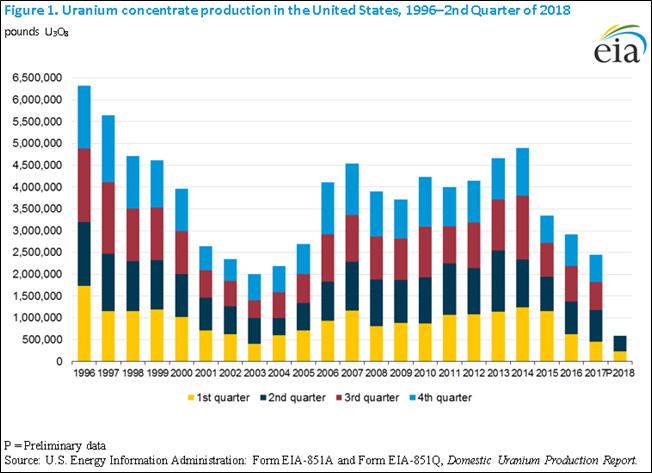 The EIA reports that U.S. uranium concentrate (U3O8) production in the second quarter of 2018 was 365,421 pounds. That’s up 61% from the first quarter of 2018 … but DOWN 50% from the second quarter of 2017. In fact, the EIA only lists one operating uranium mill, at White Mesa in Utah. And it only lists SIX in-situ recovery (ISR, the cheapest way to mine uranium) projects in production in the whole country. But wait! Hold your ding-danged, glow-in-the-dark horses! Willow Creek just shut down on July 9. That project was owned by Russia’s Uranium One. So now we’re down to FIVE! For a fuel that keeps the lights on for 20% of America’s needs. And going back to my opening about unwelcome neighbors — America has plenty of uranium, but it ain’t easy to build a new mine. We’re not going to get into the Uranium One political can of worms here. Because there’s another, juicier can of worms. Section 232. What’s that? Well, the two biggest U.S.-based producers, Ur-Energy (NYSE: URG) and Energy Fuels (NYSE: UUUU), have petitioned for some help against low-price foreign imports. In January, the two companies asked the Commerce Department, under section 232 of the 1962 Trade Expansion Act, to open an investigation into whether cheap uranium imports are harming the country. They say higher prices — or some other solution — is needed to support America’s native uranium production. Because right now, at $26 per pound, uranium is too cheap to mine! Plus, this market is undercut by Russian and Kazakh companies with government support and no environmental restraints. That’s the same act that President Trump used to slap tariffs on steel and aluminum imports. So, it’s serious. Commerce is taking its sweet time making a decision on this. Probably because there’s no way on God’s green Earth that U.S. producers could supply all the uranium that American utilities need. So, what are we talking about? Some kind of set-aside? A “Buy America First” policy? Nobody knows. But what I do know is that the wheel has turned. And we are now in a virtuous cycle for uranium. Well … uranium prices are sitting on a lit fuse. Hey, did you hear about uranium producer Cameco (NYSE: CCJ)? It recently shut down 18 million pounds per year of uranium production at McArthur River. And just now, it placed an order for 500,000 pounds of Russian-supplied uranium! Why? Because it’s cheaper to buy uranium on the spot market than to mine it. So, a producer … is now a buyer. All told, Cameco will have to source maybe 11 million to 15 million pounds of uranium per year from the spot market. And at today’s prices, it would be dumb not to. And it will stay that way until uranium prices cycle higher. But how low will prices stay this low? 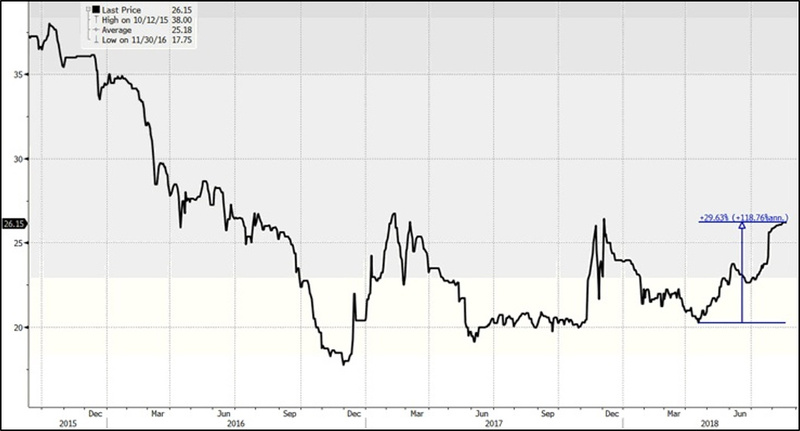 Sure, the spot price of uranium is up 30% from its lows this year. But it could go a heck of a lot higher. I’ve talked about uranium enough. I’ve warned you about what’s coming. Over and over. Multiple times. I’m already preparing my subscribers for the next big rally. You should get ready, too. If you’re doing this on your own, do your own due diligence. If you want specific “buy” and “sell” recommendations as the cycle of these white-hot stocks plays out, go here to check out my Supercyle Investor service. This market IS going to rocket. And you don’t want to be left holding a dud. Success in uranium mining isn’t easy. Success is hard. But the payoffs … man, those can be awesome. Especially when the cycles are on your side.